According to Settings > Notifications there are two types of notifications Banners and Alerts. Banners appear in the upper-right corner and go away automatically. Alerts stay on screen until dismissed. I want that all of my Chrome notifications act like Alerts. But they act like Banners. Is there something that I can do to achieve that behavior? Chrome uses its own type of notifications that aren't necessarily system native - my apologies for the extreme vagueness, I don't know how else to put it. This can depend on whether its a website notification that you can get from an update or one related to chrome itself. In your search bar input this: chrome://flags/#enable-native-notifications. Set this to enable. Then, under Setting > Notifications set both the Google Chrome apps to Alerts. Not the answer you're looking for? 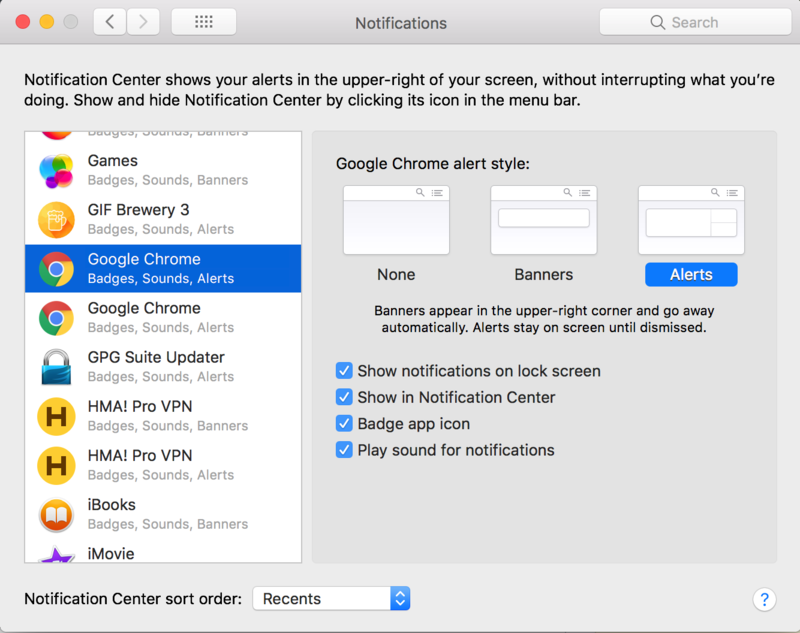 Browse other questions tagged macos google-chrome notifications . Disable App Update Notifications on OSX?